BMW X1 with 2.0-liter turbo four, was quick and agile with rear-drive and Pirelli Cinturatos on dry pavement. 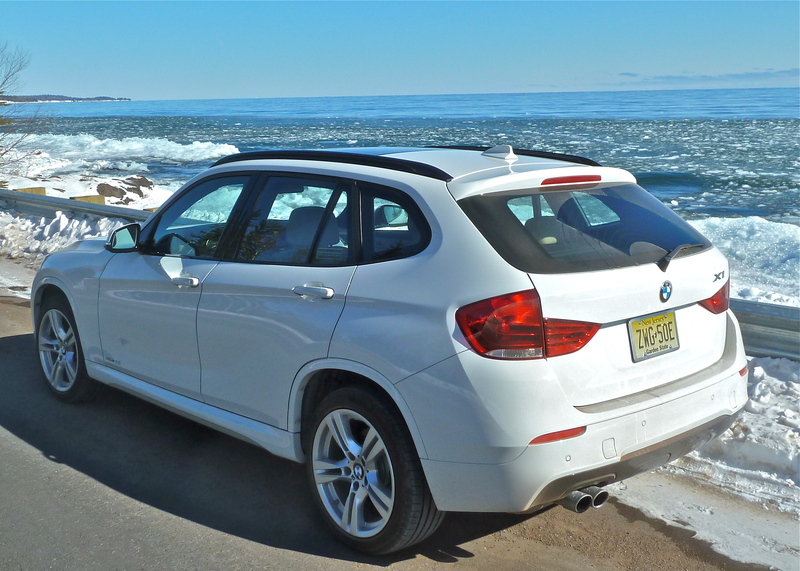 When I first had the chance to drive the new BMW X1, I was impressed with the looks and performance, and the diminutive size of the new smaller brother of the X5 and X3 SUVs from BMW’s ever-expanding stable. It is more compact than most crossover SUVs, but most people don’t need the enormous size of the heftiest vehicles that brought the U.S. auto industry to near the point of capitulation. In many ways, for those who need room for only four occupants and light storage, the smaller the better, because that means better performance and far better fuel economy are attainable. The X1 fit that bill perfectly. My first drive was last fall at the Midwest Auto Media Association fall rally, and I only drove it briefly. Impressed though I was, I was surprised to learn that the vehicle was only 2-wheel drive, with the rear wheels being the ones that drove the X1 with its front-mounted, 2.0-liter turbocharged 4-cylinder engine supplying plenty of punch for all-wheel drive. Driving as I do predominately in Minnesota, which has long and snowy winters as well as gorgeous summers, having a pickup or utility vehicle with rear-wheel drive should be grounds for incarceration. 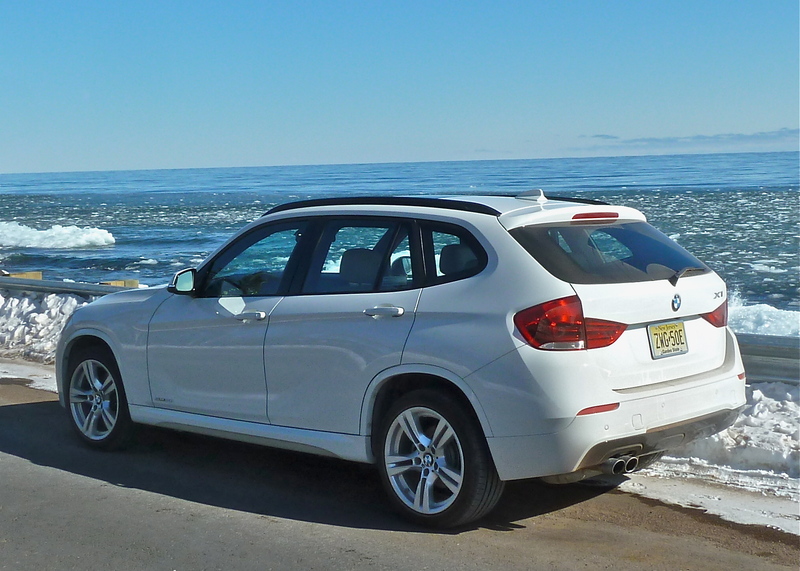 I was assured the X1 does come with X-drive, BMW’s slick all-wheel-drive system. That made me eager to get one for a week-long test drive over the winter months. Traditions generally cross past, present and future boundaries, and every March in Minnesota, a couple of those traditions run smack into each other. One of those is that when it comes time for the state high school hockey or basketball tournaments, a late-season blizzard is the norm. This year, Mother Nature celebrated both of those tournaments — and many of the days in between — with the snowiest March ever. Those heavy snowfalls, of course, afforded extra winter test-driving time. In automotives, one tradition from the past is that conventional front-engine/rear-drive affords the most exciting and satisfying high-performance “feel” for sporty vehicles. In Minnesota, of course, it snows every once in a while, and when it snows on top of ice, treacherous road conditions can lead to all sorts of slippery, terrifying driving, and nose-heavy front-engines with light-in-the-rear, rear-wheel-drive adds more than just excitement to the mix. When front-wheel-drive vehicles took over, white-knuckle driving in icy conditions ended in Minnesota and other snow-belt states, and all-wheel-drive has taken that sense of security to another dimension. Even with front or all wheels driving the vehicle, tires are still extremely important to any driver’s peace-of-mind in wintry driving. Most major brands make special all-season or winter tires, with the most popular being the Bridgestone Blizzaks, a softer-compound tire that grips ice, churns through fresh snow, and keeps improving its ability to work well enough on dry pavement without wearing quickly. My favorite winter tires are the Nokian WR or WR-G2, because they have uncompromising tread compound that maintains its flexibility no matter how cold, while high-performance tires tend to harden and have less traction when it’s cold. Some manufacturers equip their press-fleet vehicles with good all-season tires during winter. Others don’t seem to be aware that there’s a difference. BMW is one of the few companies that stubbornly refuses to change from the all-out handling performance tires it sends on its vehicles, regardless of region. 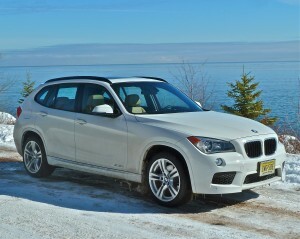 BMW also is one of those German companies that stubbornly held firm on rear-drive vehicles until recently. Now it sells its splendid 3-Series, 5-Series, and even 7-Series sedans with X-drive, and of course its various SUVs also have X-drive. While smalleer than most compact crossovers, the X1 still has good storage space. The 4-cylinder engine in the X1 sDrive 28i is the superb 2.0-liter, dual-overhead-camshaft gem out of the 328 sedan, with direct injection, Valvetronic and Double-VANOS steplessly variable valve-timing. After twin turbochargers pump additional force into that engine, it creates 240 horsepower and 255 foot-pounds of torque. Obviously, that power through all four wheels would be a special attraction in Minnesota winters. And especially in Duluth, which is built along the northern ridge that runs along the western tip of Lake Superior, meaning the streets are pretty level, but not many of them are at exactly the same elevation, because the avenues that run up the hill run at about 20-30-degree slopes, and you have to make it up nine or ten blocks of that to get up to the main shopping mall, some of the high schools, the University of Minnesota-Duluth, and the airport, to say nothing of the highway heading toward the Iron Range. A lot of special weather hits the Head of the Lakes area, and a lot of special driving is required to survive the winters and scale those cliffs. 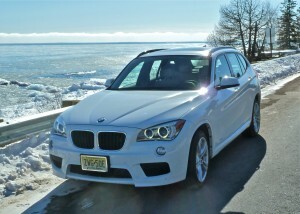 Ah, but the gleaming white BMW X1 that was delivered from Chicago to my home in Duluth, Minnesota, did NOT have X-drive. It had rear drive. No problem for the fellows delivering the car to me, because it was calm and bright. It snowed after they left. When I checked to be sure that the X1 didn’t have X-drive, I also noted that the very neat low-profile tires on the very neat alloy wheels were Pirelli P7 Cinturato high-performance tires. Almost racing slicks. Every car I get for a test I make sure to send off with my wife, Joan, as well. She’s an excellent driver and provides excellent feedback. But on this particular Friday, I sent her off in a different test vehicle, which had all-wheel drive. That night, I was going to a hockey game, she was coming home, so we met for a light dinner as we crossed paths. My first thought was to swap vehicles, and let her take the X1 home, where it could reside while the snowstorm gathered its momentum during the game. Then I thought no, it wouldn’t get that bad. When I came out after the game, there was about 3 inches of snow in the arena parking lot. Not a problem. Our home is out the North Shore a few miles, and then up about 2 miles, to the top of the ridge that extends from Duluth all the way up to Canada. It’s a long, slowly building slope, with an abrupt hill for about the final two blocks. As I drove out from town, I noticed that there was more snow out there. And when I turned up our road, there was probably 6 inches on the ground, which hadn’t been plowed or sanded. I made my way carefully along, and even on the slight rise, the traction control chattered a bit, changing its mind frequently about which of the rear wheels had better traction. It was immediately clear that the Pirellis were trying to prove that neither side had any advantage. Or any traction. When I got to the last and steepest part of the hill, the X1 went slower and slower until it stopped, unwilling to go any further. 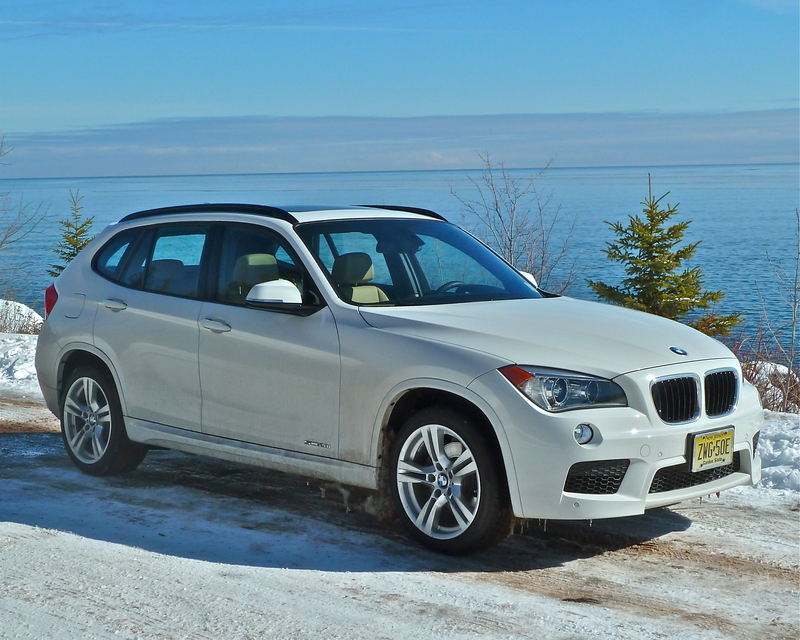 High-performance tires and RWD were fine in the dry, but left the X1 helpless on any hills after a light snowstorm. I backed down about 3 blocks and backed into a driveway, then headed back down the road, before turning around in another driveway and taking another run at it. I tried switching the traction-control off, but the X1 then wanted only to slew sideways, so I switched it back on. The problem was that the Dynamic Stability Control and the traction-control are so sophisticated they won’t let the vehicle go any faster, no matter how hard you step on the gas, if they sense a lack of traction, which meant that on my second, and third, tries, when I went the full 2 miles back down to the main freeway to get a good start, the X1 would go pretty well until time to go up the final hill. It was slippery enough under the 6 inches of unplowed snow that no matter how much gas I gave it, we’d go slower and slower until we were at a standstill. While not really spinning, the slick tires were governed by the electronic traction-control system, which meant they alternated split-second tries as the system decided which wheel would not advance us any further. And it was a draw. Closest I got was about 50 yards from my driveway, so I again backed down the hill, and into a driveway, then went the rest of the 2 miles to the freeway. This time I had a final plan. The BMW 8-speed automatic transmission is the Steptronic unit with Adaptive Transmission Control, ECO Pro mode, and Sport and Manual shift modes. It’s simpler to just say there were steering wheel paddles to manually control the super-smooth shifts. My problem was being unable to build up enough speed — even though my road was treacherously slippery — to build up sufficient momentum to get up that last hill before the traction control completely balked the engine to a stop. So I drove along the freeway, with the X1 in manual mode, and I paddle-shifted up to second, and then third, then made a slithering, side-slewing turn onto my road. I crested the first rise, and then had about a half mile to build up more speed, but I kept the car in third via the paddle-controls. As the slope grew slightly, and then more, the traction control wanted to slow the X1 down, but the revs were held higher and the speed was correspondingly more, and even as we slowed with the electronics frantically fighting to gain control, our momentum was sufficient, and I swung into my driveway. My adrenaline high was finally relieved, and I didn’t realize until I got inside the house that I was nearly exhausted from the ordeal. The rest of the week was comparatively snowstorm-free, although the area was never free enough of slippery driving conditions to fully enjoy the best features of the BMW X1, which had a base price of a quite-reasonable $30,650, but with the M-Sport Line, and Driver Assistance, Lighting, Premium, Technology, and Navigation packages, the sticker rose to $44,245. In the cold weather, our mostly city fuel economy was right about on the EPA estimate of 24 miles per gallon, although we never got close to the highway figure of 34 mpg. Optional X-Drive should be mandatory if the X1 is to be driven within view of floating ice chunks in Lake Superior. Along with those other traditions of state high school tournaments the following two weeks, along with their own, private blizzards, the Minneapolis-St. Paul Auto Show makes its 10-day run at the Minneapolis Convention Center. I had the opportunity to guide a small group of businessmen through the show, picking out the highlights of the newest vehicles. The Minneapolis-St. Paul show is nothing like the major shows at Los Angeles, Detroit, Chicago, or New York, but it’s fun, nonetheless. “Have you ever been to Duluth?” I asked him. He said no. I told him he should visit sometime in January or February, because a couple days of trying to drive a mile up an avenue sloping 25 degrees, he would appreciate the term “X-Drive” a lot more than “Cinturato.” And he would long for the days of being a flatlander back home in Maine. Wow, this post is pleasant, my younger sister is analyzing these things, so I am going to inform her.